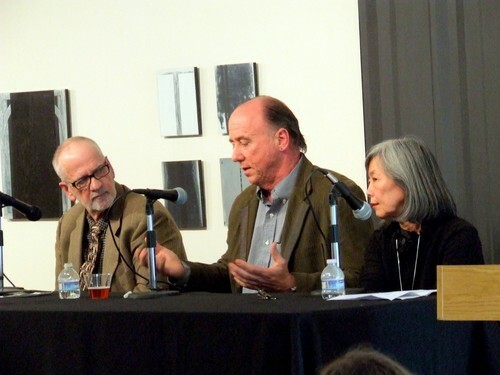 NC Art Outreach Project NYC-based panel, Peter Plagens, Miles Manning and Lilly Wei discuss their views on contemporary art and the position of artists who are working on the periphery of the mainstream on April 22 at Green Hill Center for NC Art. Photo courtesy of Joe Wheby. Green Hill Center for NC Art hosted its first biennial NC Art Outreach Project, a program that was made available through a grant by the Tannenbaum-Sternberger Foundation. The NC Art Outreach Project was designed to draw attention and facilitate a two-way dialogue between national artists, critics and gallery owners and North Carolina artists. The project was a two phase program which consisted of (1) February 16, 2013 Pecha Kucha presentations juried by Edie Carpenter, Director of Curatorial and Artists Programs, Dave Delcambre, arts writer and founder of NC Artblog, and Tom Patterson, arts writer and independent curator; and (2) April 22-23, 2013 New York City-based panel, including Miles Manning, Director of the Elizabeth Harris Gallery in New York, Lilly Wei, New York-based independent curator and contributing editor for ARTnews, and Peter Plagens, American painter, art critic and novelist. The program began on April 22 with the panelists in a private session with the participating artists in Green Hill Center’s current exhibition, Independents, Brett Baker, Mark Brown, Ashlynn Browning, Philip Lopez and Bonnie Melton. The group engaged in an in-depth dialogue about their work, studio practices, entrepreneurship, and career trajectory. On the evening of April 22 from 5:30-6:30 p.m., Green Hill Center hosted a discussion, where the Manning, Plagens and Wei had an informal dialogue on their views on contemporary art and the position of artists who are working on the periphery of the mainstream. Plagens and Manning discussed the importance of regionalism and global pluralism. Manning commented, “Provincialism or regionalism is a state of mind. You are only limited by the limits you put on yourself. Timing is everything.” Coming from another perspective, Wei commented that in the past, artists were discovered by a curator. She further explained that today we are seeing a shift in that collectors are finding artists and are typically doing so by going to art fairs, such as Art Basel and Venice Biennale; art festivals are an important way for artists to be seen today. A private dinner followed at the home of Walker and Dabney Sanders. Green Hill Center makes it a priority to support artists at all stages of their careers, including emerging artists who are embarking on professional art career goals as well as artists in the middle stage of their careers who received recognition equal to the quality of their work. “A structured Art Outreach Project should be an effective way for North Carolinian artists to be seen by outside art professionals in a focused way; we viewed around 350 works by 25 artists over the course of two days,” Wei explained, “something that without the program would not have occurred—nor, I imagine, would the artists have been able to share their work with so many of their peers. Green Hill Center’s initiative should prove stimulating and a great resource for the region’s artists, and Executive Director Laura Way, Curator Edie Carpenter and their team should be congratulated on the launch of their new project.” Following the success of the 2013 NC Art Outreach Project, Green Hill Center announced that this will be a biennial project. The 2015 NC Art Outreach Project will be tied to a specific style or genre and Green Hill Center will provide an open call for artists a year in advance. In addition to the NC Art Outreach Project, Green Hill Center has adopted a new initiative, the Open NC Art Review, which will continue to offer North Carolina artist’s fruitful opportunities for exposure and personalized contact with art professionals. The Open NC Art Review will be an open platform for sharing opinions in a collegial atmosphere and will extend the visibility of North Carolina artists beyond its borders. The initiative will nurture artistic growth and help artists develop strategies that allow for sustainability. The first Open NC Art Review will be held on March 8, 2014 from 2-4pm. The review will be a first-come-first-serve basis, and the reviewing panel will include Edie Carpenter and other North Carolina arts professionals. The panel discussion (April 22) and Pecha Kucha presentations (April 23) were free and open to the public. Green Hill Center for NC Art is located at 200 North Davie Street, in the Greensboro Cultural Center. Green Hill Center is the only non-collecting institution dedicated to presenting, promoting, and advocating contemporary visual art and artists of North Carolina. Green Hill Center receives major support from the United Arts Council of Greater Greensboro and the N.C. Arts Council, a division of the Department of Cultural Resources.